How Many More Popular Votes Did Hillary Clinton Get Than Donald Trump? Although the actual act of voting takes only a few minutes, tallying those votes is a much more time-consuming process. It's been more than a week since Donald Trump was named the president-elect after securing more than 270 electoral votes late Nov. 8, and yet ballots are still being counted in at least four states. While the counting isn't completed just yet, Democratic nominee Hillary Clinton's popular vote lead has surpassed 1.3 million. As of Thursday afternoon, Clinton's popular vote lead had increased to 1,364,450 votes. The Democratic nominee was reported to have earned 62,878,946 votes compared to 61,514,496 tabulated for Trump, according to nonpartisan group Cook Political Report. That's a significantly bigger popular vote lead than Democrat Al Gore had over then-president-elect George Bush in 2000. Although the Electoral College handed the presidency to Bush, Gore lead the popular vote by 540,520. While Trump managed to secure the majority of electoral votes on election night, neither Clinton nor Trump have won more than 50 percent of the popular vote — Clinton currently stands at 47.9 percent compared to Trump's 46.8 percent. It is unclear if the remaining unprocessed votes could push Clinton over 50 percent. While the Electoral College determined the president-elect a few hours after polls closed on Nov. 8, provisional and absentee ballots are still being counted in California, Utah, Washington, and Michigan, according to Politico. 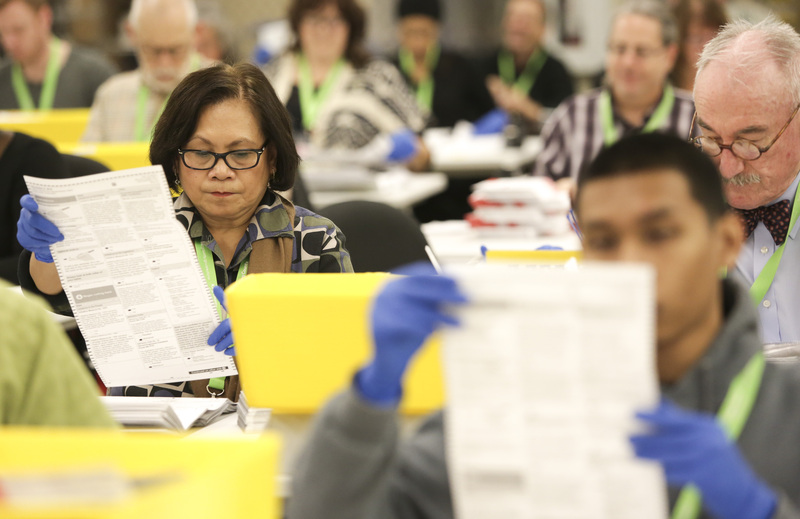 In California, where absentee ballots can be postmarked as late as Election Day, there were an estimated 3,093,849 unprocessed ballots that still needed to be counted as of Thursday afternoon. At roughly that same time, Washington had an estimated 129,669 unprocessed ballots still waiting to be counted. Clinton's Electoral College loss has prompted some Democrats, like California Sen. Barbara Boxer, to push for its elimination. "In my lifetime, I have seen two elections where the winner of the general election did not win the popular vote," Boxer said in a statement after proposing legislation for a Constitutional amendment. "The Electoral College is an outdated, undemocratic system that does not reflect our modern society, and it needs to change immediately. Every American should be guaranteed that their vote counts." The 2016 election was the fifth time in the nation's history where the popular vote winner did not also win the Electoral College. It should be noted, however, that even though votes are still being calculated, and even though Clinton's popular vote win, Electoral College loss paradox has spurred a lot of talk about changing the system, the election is largely considered settled. Clinton may hold more than 1.3 million more votes than Trump nationwide, but the president-elect led where it mattered most, in the swing states.